contents under pressure. Do not puncture or incinerate container. Do not expose to heat or store at temperatures above 120º F (49º C). Hold the can upside down and press nozzle to dispense the topical foam product onto your fingers. The total amount of foam applied should not exceed half a capful. Using your fingers, spread the foam over the hair loss area and gently massage into scalp and then wash your hands well. Men’s ROGAINE® is for men who have a general thinning of hair on the top of the scalp (vertex only, as shown below). Not intended for frontal baldness or a receding hairline. 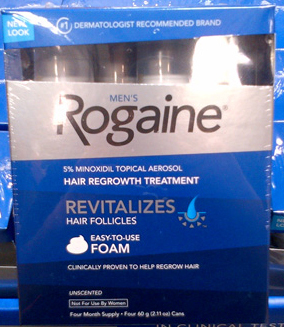 Men’s ROGAINE® has been shown to regrow hair in men with the following degrees of thinning hair or hair loss. If men have more hair loss or hair loss in a place different than shown above, Men's ROGAINE® Foam may not work. Free shipping does not apply for this product!